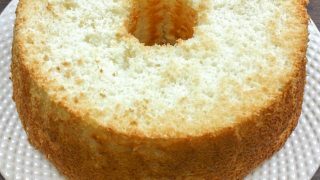 Homemade Angel Food Cake is one of my favorite recipes. It’s easy to make and comes out fluffy and perfect. There are a lot of treats you can make with angel food cake. The cake can be covered in chocolate frosting, cream cheese frosting (picture below), or with some fruit drizzled on top. 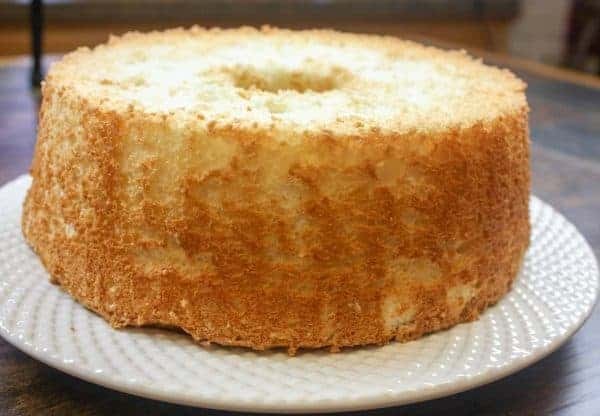 Angel food cake was one of my favorite recipes that my grandmother made. She added a cream cheese frosting and it was to die for. (Grab the cream cheese frosting recipe here). Angel food cake can sometimes be a little scary to make. It seems like we have to beat the egg whites perfectly and add the ingredients at just the perfect time. But, it really is a simple recipe that will turn out perfectly. I bought the angel food cake pan at the thrift store for less than two dollars. I cleaned it up and decided it needed to have something baked in it. So, an easy angel food cake recipe was the perfect treat. Before you get started, separate your whites out and leave on the counter for about an hour to bring them to room temperature. 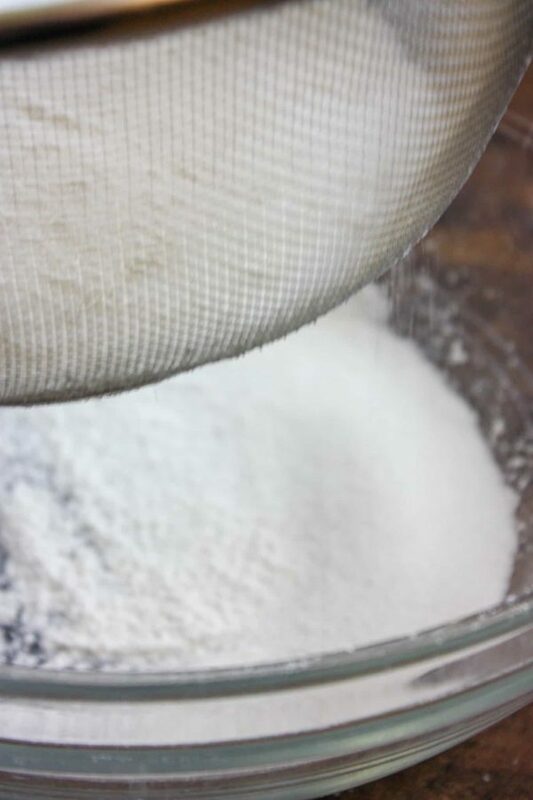 Add the cake flour to a sifter. Add the sugar to the sifter. How do you make cake flour from all-purpose flour? I didn’t have any cake flour on hand, and I didn’t want to make a run to the grocery store. 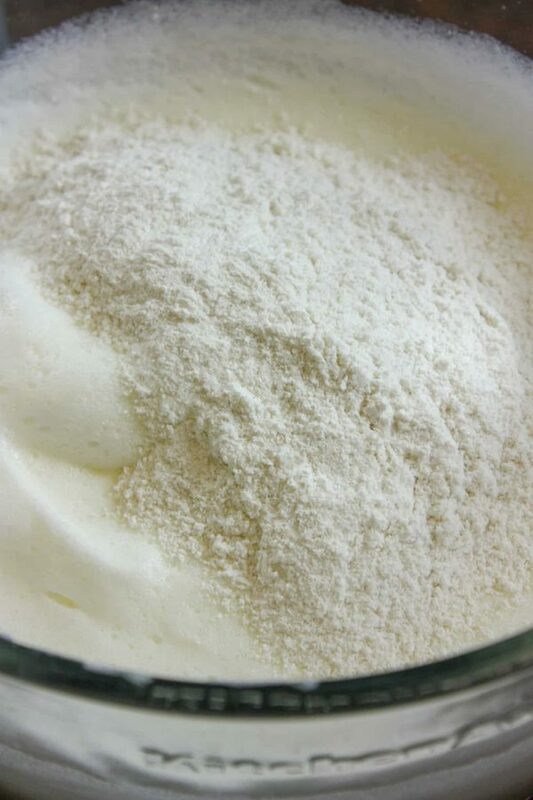 You can make cake flour by combining all-purpose flour and cornstarch. I try to keep cornstarch on hand and it lasts forever. 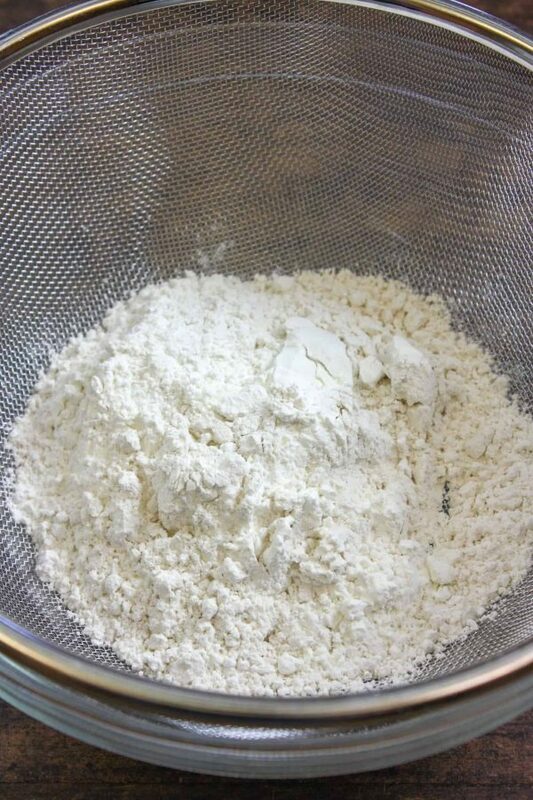 Fill one measuring cup with all-purpose flour and remove two tablespoons of the flour. Then add two tablespoons of cornstarch to the cup. Sift it together and you’ve got cake flour. Sift the cake flour and sugar together four times. Yes, four times. You want the cake to be as fluffy and light as possible. Set aside. 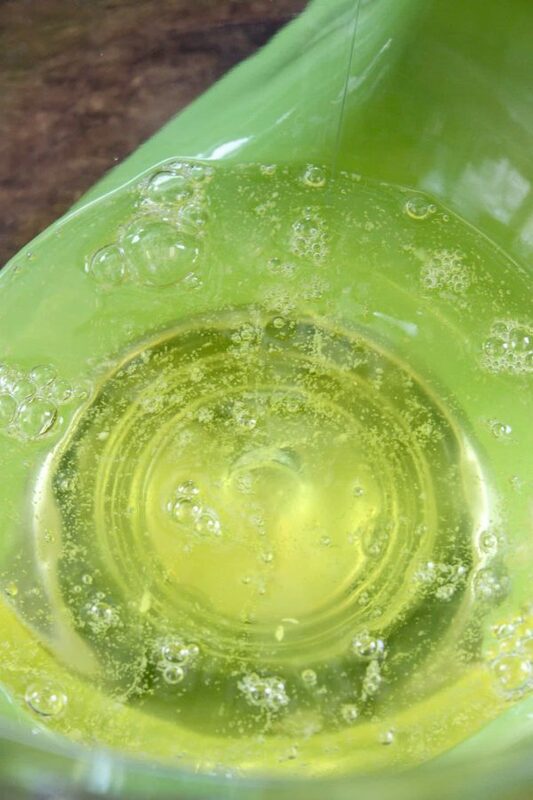 Add the twelve, room temperature egg whites to a large mixing bowl. Since all eggs are different sizes, you need about 1-2/3 cups of egg whites for this recipe. If it’s a tad over or under that’s ok.
Add the cream of tartar. Beat the eggs until they have soft peaks. Is cream of tartar necessary for meringue? No, but it sure makes your egg whites extra fluffy. 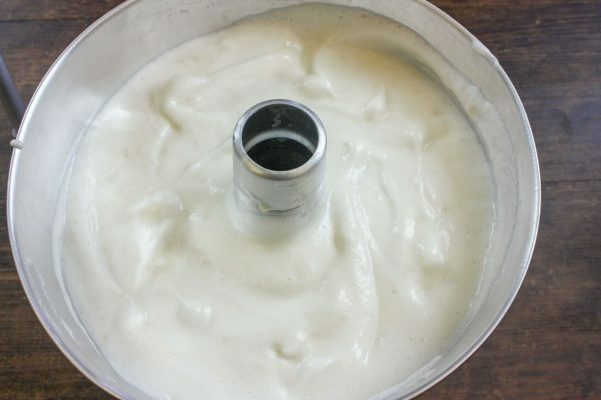 What is the purpose of cream of tartar in meringue? To help stabilize the egg whites. The cream of tartar can help the egg whites triple their size, and handle the heat a little better if you’re making a pie with meringue. 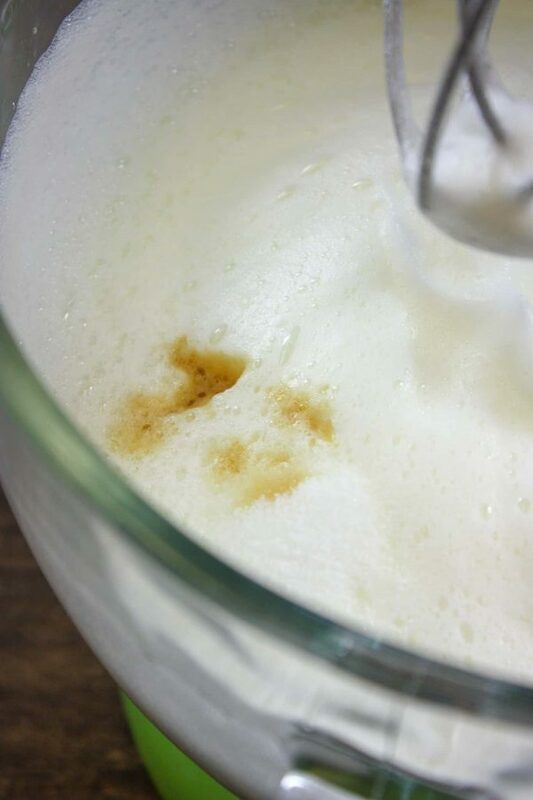 Pour the salt and vanilla into the whipped egg whites. Pour the remainder of the sugar into the meringue and mix together. 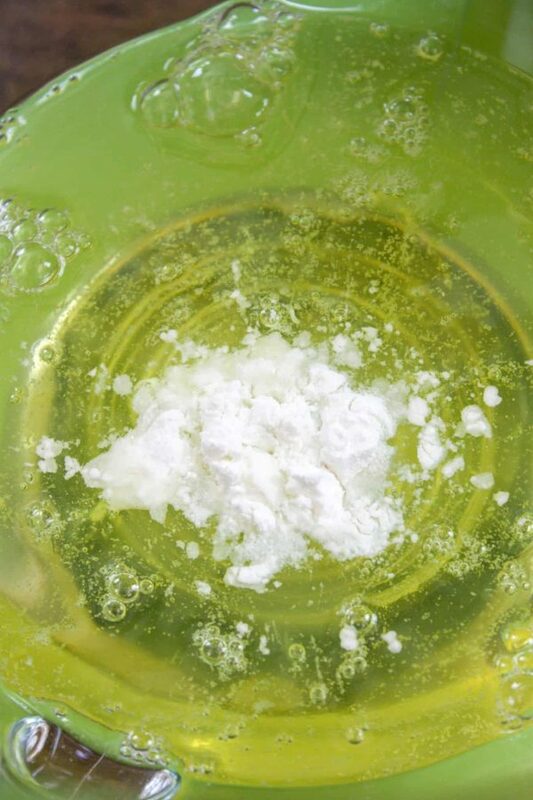 Add the sifted flour and sugar mixture to the egg whites and fold gently into the mixture with a spatula. 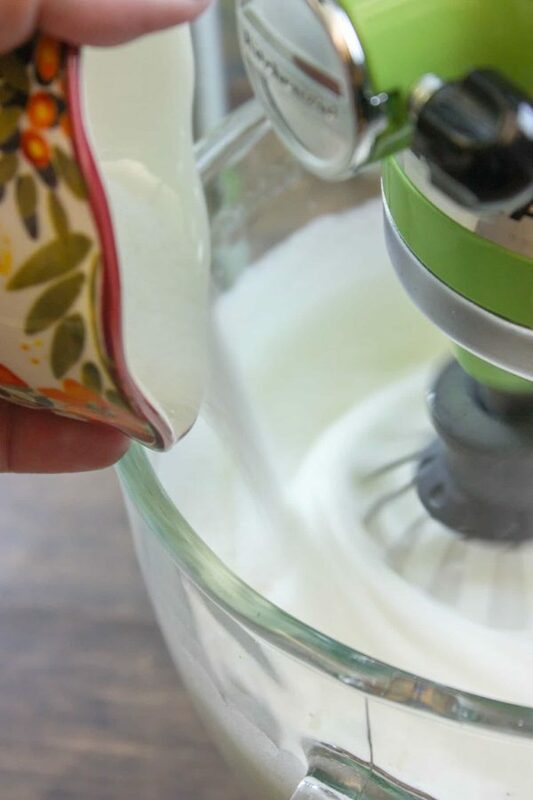 (If you use the mixer, it might flatten the egg whites). Pour the cake mixture into an ungreased cake pan. Bake for 35-40 minutes or until the cake springs back when you touch the top of it. After the cake bakes, invert it so it’s resting upside down on a cooling rack. 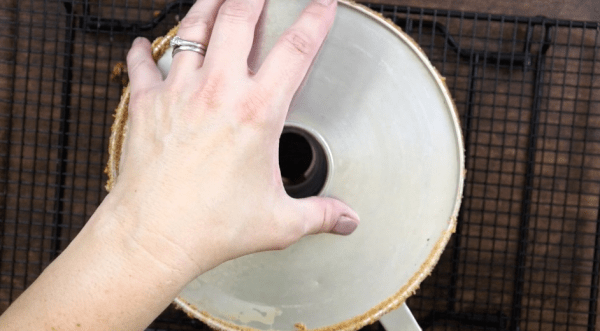 After it cools, gently slide a knife around the sides, center, and bottom (You’ll need the angel food cake pan that has the bottom that comes out separately). Now you can decorate any way you’d like to. 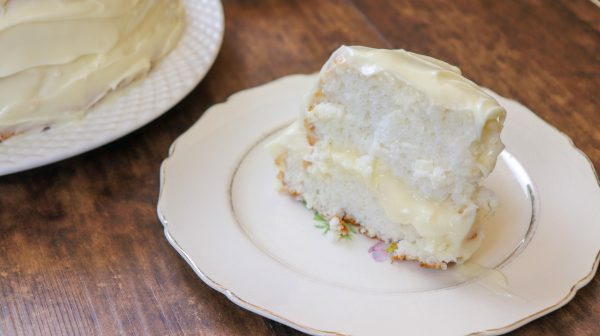 You can make so many delicious desserts with angel food cake. You can add chocolate, vanilla, cream cheese, or any type of frosting. Try some fresh fruit on top, or cut it up into pieces and dip the cake into a chocolate fountain, or fondue. You can fry the angel food cake, as well. So many choices! 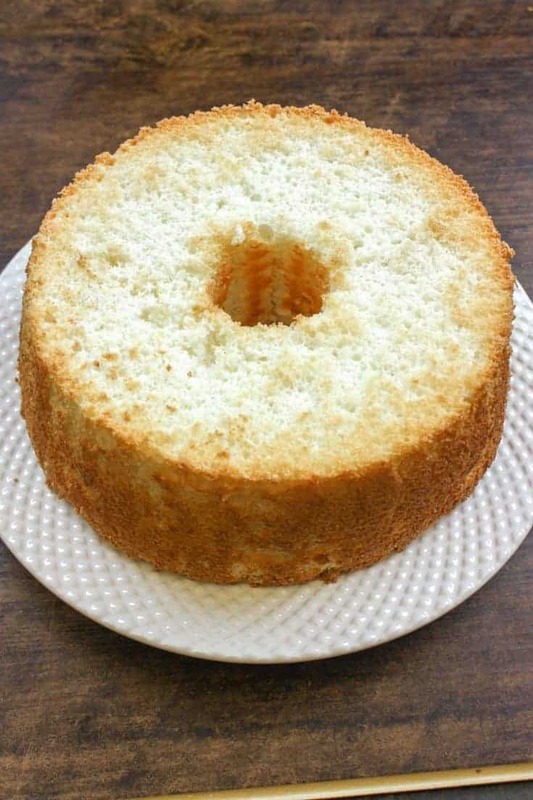 Homemade Angel Food Cake is one of my favorite recipes. It's easy to make and comes out fluffy and perfect. There are a lot of treats you can make with angel food cake. The cake can be eaten with chocolate frosting, cream cheese frosting or with some fruit drizzled on top. Separate out the egg whites in a medium-sized bowl and leave out on the counter for one hour to bring them to room temperature. 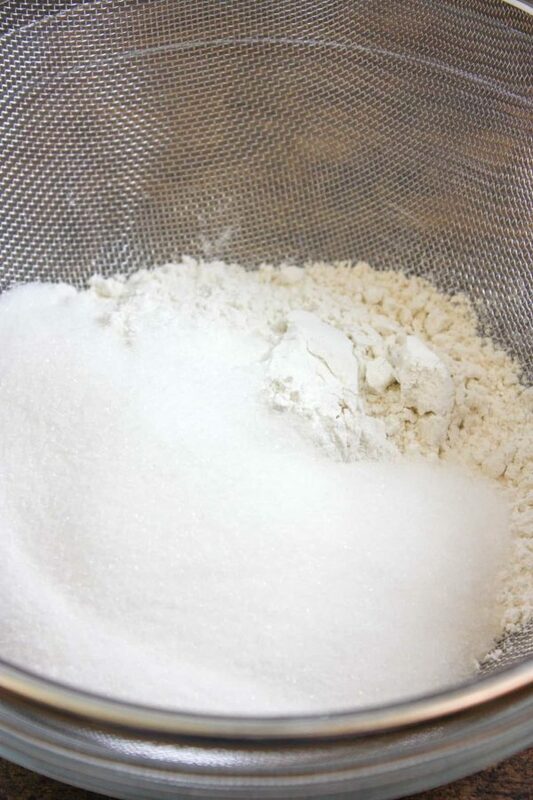 Add the cake flour and 1 cup of sugar to a sifter. Sift four times and set aside. Add the egg whites and cream of tartar to a large bowl. Beat until you get soft peaks. Add the salt, vanilla, and 3/4 cup of sugar and mix. Add the cake flour and sugar mixture to the egg mixture and gently fold in with a spatula. Pour into an ungreased angel food cake pan and bake for 35-40 minutes. Invert pan immediately after taking it out of the oven until it cools. After the cake cools, gently scrape the sides and center with a knife and remove the cake. Next, scrape the bottom.